Simple to sign up, hassle free forever. Let us show you how simple it can be to save money on your energy bills. Once you're signed up to Switchd we'll always ensure you are on the best energy deal. Once and once only will you need to know your online account details or usage and tariff. We'll help extract all the relevant information that's needed for a switch and store it securely in our systems. An email will pop into your inbox letting you know that a better deal has been found and that the switch is going ahead. No need for you to do anything, unless you want us to halt the switch. You save, we keep checking. You can login in to your dashboard to see how things are going with your switch. We'll manage all the admin and continue to check the market for the absolute best deal. Communication is something we take very seriously at Switchd. Our smart dashboard ensures you always have access to your energy accounts should you want to see the information. We'll let you know when a switch is going ahead and how much you are going to save. You don't need to do anything for the switch to go ahead, instead why not plan what to spend your extra money on. 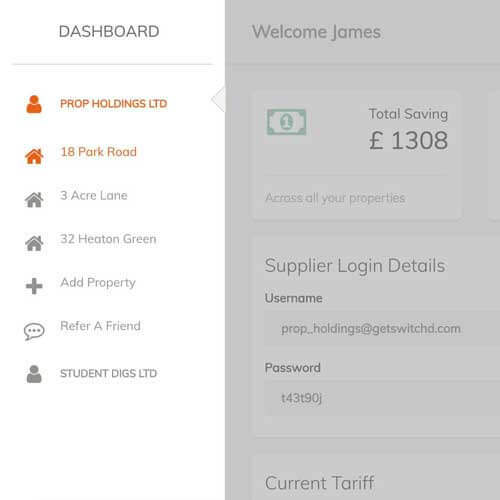 Should you want to see what energy tariff you are on, see how much you've saved or refer a friend; our handy dashboard gives you access to all your energy details in once place. Our product has been built with multiple properties in mind, taking away the admin of tracking multiple accounts. Keep payment and communications separate but all of your accounts in one handy dashboard. Get in contact if you have any questions and we can help with the onboarding process. We build explanation videos based on customer feedback. Below are two concepts explained in more detail. If there is more you'd like us to explain we'd love you to be in touch. How do we know how much we'll save you? What is a debit/credit on my account?